Light pink walls, an original “nasone” fountain, a beautiful garden with wood benches, 21 suite bedrooms for 91 students, a large kitchen, dining area, laundry room, student activity center, and a roof top terrace are only a part of the newly restored Villa, the student residential space just two blocks away from the Rome Global Gateway, on the Celio Hill in Rome. 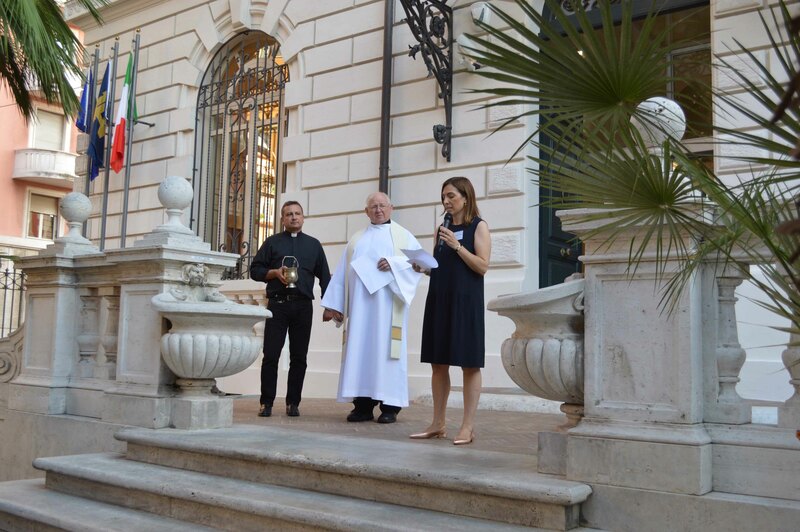 On September 22nd the Villa was officially inaugurated and opened its gates to the local community, staff, faculty, fellows, the ND Alumni Club of Italy, service providers, and partners. Fr. Robert Epping, Superior General of the Congregation of Holy Cross, together with Don Lorenzo di Pietro, associate pastor from the local parish of Santa Maria in Domnica alla Navicella, blessed the Villa and all the students who will be living there during this current year. 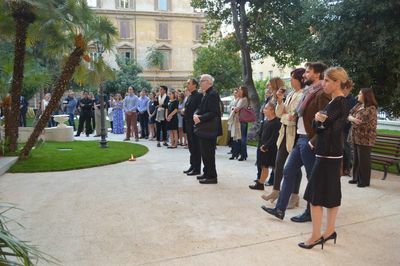 Newly appointed RGG Academic Director, Heather Hyde Minor, welcomed and thanked the faculty, staff, students and partners who allow the University of Notre Dame to pursue in Rome the same mission that Fr. Sorin envisioned when he first founded the University. The goal of Notre Dame’s Villa is to foster an academically, culturally and spiritually transformative study abroad experience for Notre Dame students in Rome. The Villa’s living-learning community will promote student learning by establishing direct links between the residential, academic and co-curricular activities of study abroad students in Rome. Purchased by the University of Notre Dame in 2015 and restored in 2016 under the guidance and leadership of architect Anthony Wingfield, Director of Operations at the RGG, the Villa brings together undergraduate Notre Dame students from across the arts and sciences that have a shared interest in expanding their academic and cultural horizons through study abroad in Rome. Constructed in the early twentieth century, this beautifully renovated villa once served as a private residence and later as a school for Jewish children just before the fascists promulgated the racial laws of 1938. In residence, the inaugural rector, Justin Bartkus, together with the ARs Antonella Piccinin and Christopher Baker, are working hard together with RGG staff, at merging classroom learning with social and community interactions in and around the city of Rome. Students are given the opportunity to immerse themselves in a variety of academic and cultural programs and resources, such as language exchanges, small Bible groups, wellness and food related activities, in which Italian members of the community participate as well. For further information about our facilities. Originally published by Costanza Montanari at international.nd.edu on September 26, 2017.